Arrival in Chikan 赤坎 is quite spectacular. 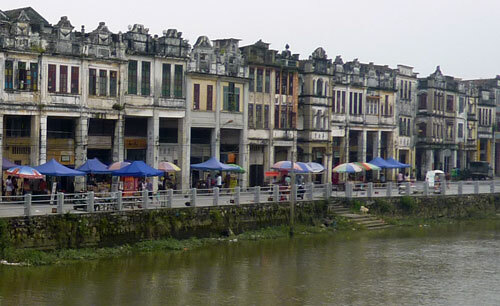 The town’s unique riverine setting, and it’s unbroken line of Qilou style buildings strung out along the entire Tanjiang River front, is one of Southern China’s most impressive sights. The town invites exploration, but at the same time there are the small, appealing restaurants under the Qilou arcades. This poses a dilemma for the traveler; exploration first, or a cold beer; we chose the latter, but both options are great. Chikan is a place to linger. 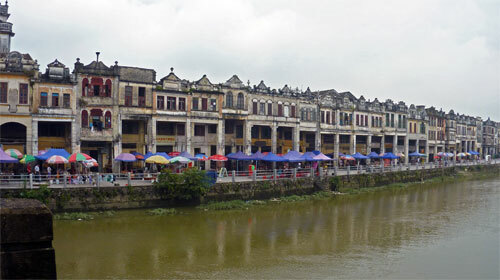 Qilou buildings are a construction style that developed in the late 19th and early 20th Century in Guangdong Province. 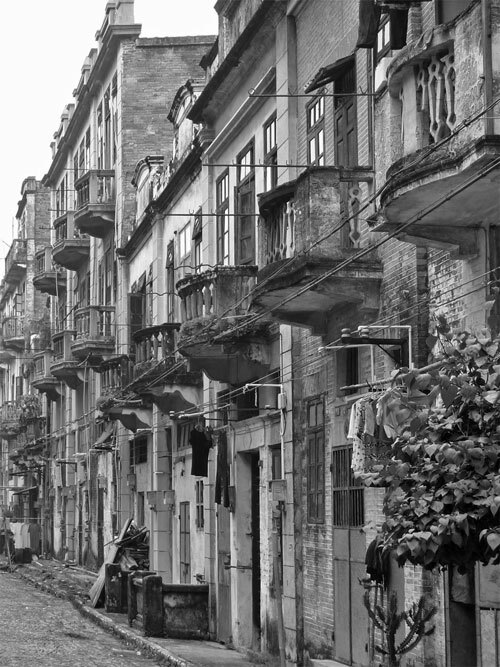 As city streets were widened, Qilou buildings began to spring up. 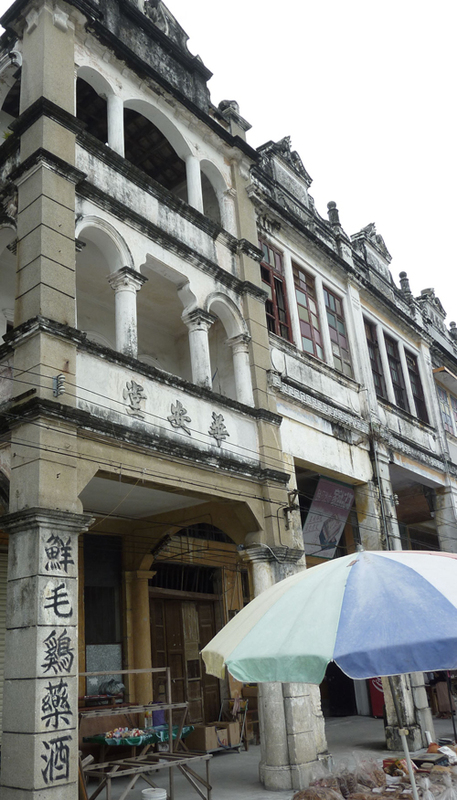 They combined 18th Century Western architectural styles with traditional Cantonese styles. The most prominent features are the pillared columns that provide shoppers and shopkeepers’ alike with shelter from the merciless sun and the torrential downpours. The upper floors, usually three or four, are characterized by their European influenced wooden shutters or stained glass windows. 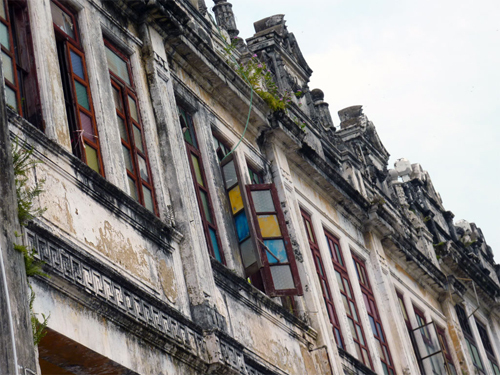 While some of the river front houses have been turned into tacky souvenir shops, the backstreets, and in fact, the rest of the town behind the river, are a living museum for those wishing to appreciate the Qilou building style. However, one has to admit that some of the Qilou buildings have seen better days. 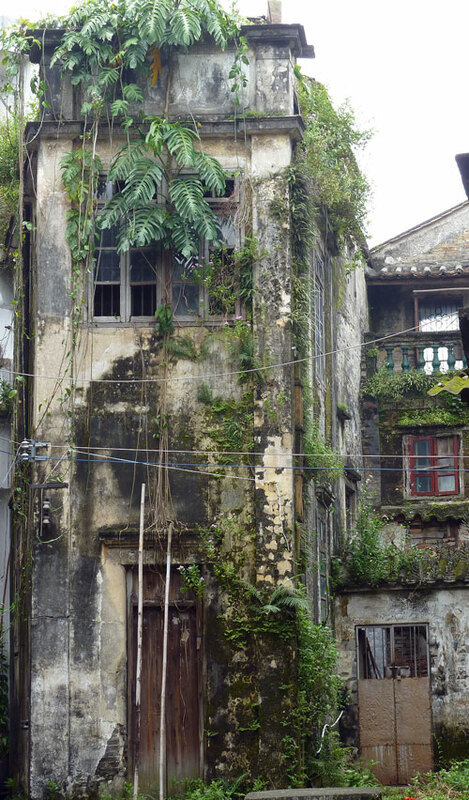 Moss and wild plants fight for space amidst the cracks in the facades. 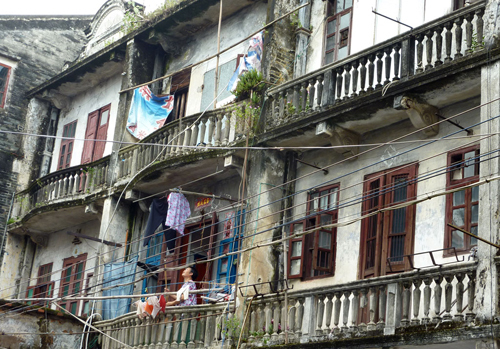 Chikan’s Qilou heritage is calling out for restoration, but at what cost? Prompting one to ask the never ending question over whether the restoration of historic towns in China will inevitably result in crass tourist deveopment? Only time will tell in the case of Chikan. For now, wandering Chikan certainly feels like entering a time warp or steeping into the perfect backdrop to an old historic Chinese movie; and that is not far off the mark! 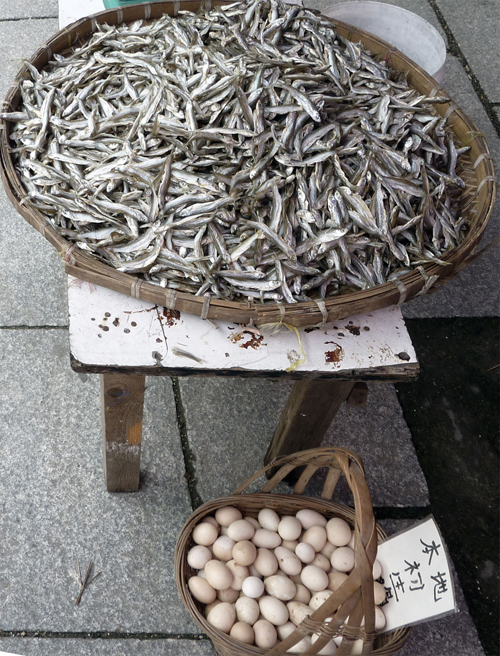 The historic village of Chikan has been around for more than 350 years, but its claim to fame is far more recent. 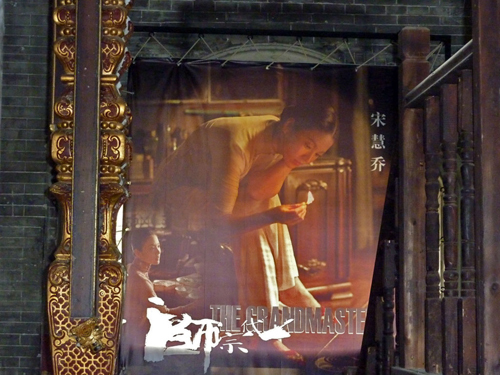 Wong kar-wai’s The Grandmaster was filmed in Chikan’s beautiful Lingnan Studios. 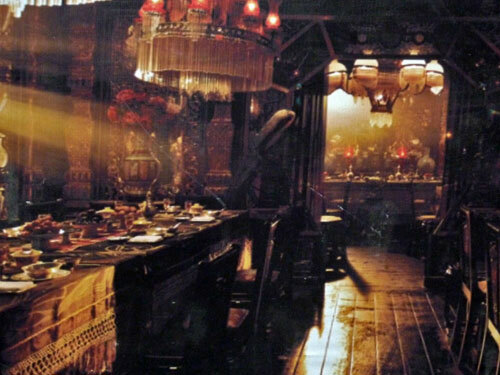 The Lingnan Studios are to the left as you cross the bridge and are housed within a group of spectacular buildings. 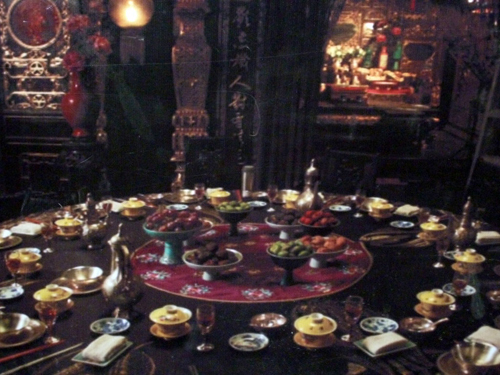 You can now visit the studios and see the props and parts of the studio where the famous scenes in The Grandmaster were shot. That includes the wooden trees where Kung Fu masters practice their chops and the glamorous bedrooms and now empty massive dinning room. The Grandmaster, just out in now in Madrid, chronicles the life of Yip Man (IP Man), a famous teacher of the Wing Chun branch of Chinese Martial Arts, a style made world famous by Bruce Lee Click here for more information. 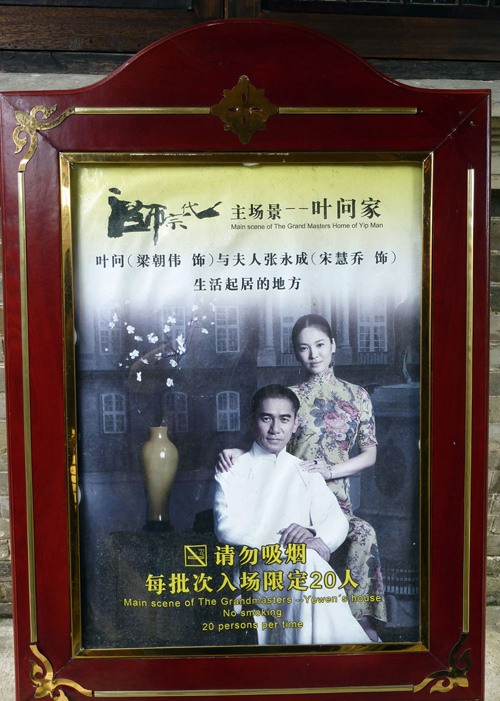 Within the studios is a small exhibition dedicated to those immigrants who were forced to leave China in the early 20th century – often forced to sell themselves into slavery- to make a living. 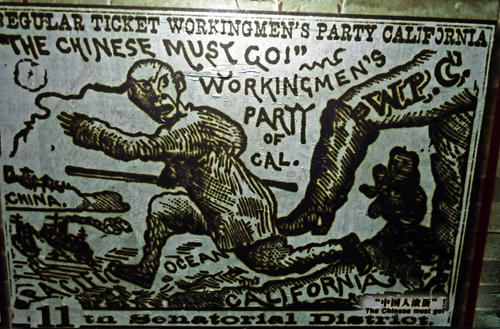 We can see derogatory cartoons of little Chinese people being booted out of California by members of “Regular Ticket Workingmen’s Party”. Then there are the tragic stories. One tells of a man forced to go abroad almost immediately after his wedding. As he couldn’t afford to come home his wife saw herself obliged to adopt a girls to carry on the family. During the Japanese occupation they suffered terribly and after liberation the poor girl died of over-eating…. The man had never even seen his adopted daughter and was only able to meet his wife once more, on Hong Kong territory… What a life! There is no entrance ticket for Chikan, but there is one for the film studios. 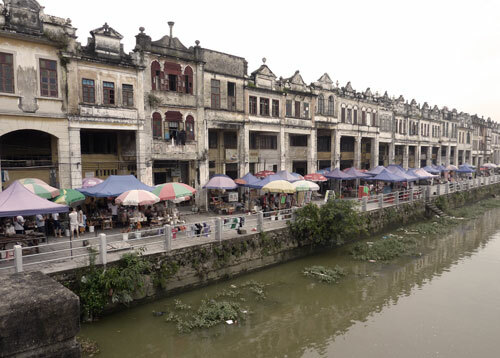 If you have a Through Ticket (Tongpiao/ 通票) for all the Diaolou buildings in the Kaiping area, the film studios are included. 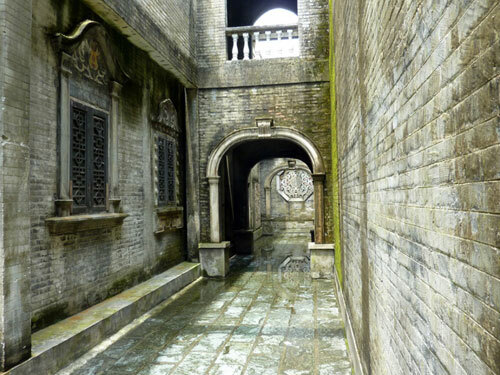 Chikan is usually included on any visit to the Diaolou around Kaiping and is only a few kilometers from the Zili Diaolou Cluster and the Yuan Gardens. If you’ve hired a car and driver (包车 baoche) from Kaiping, you’ll be taken to ChiKan. Otherwise, take one of the small local buses from the Kaiping’s Yici bus station that run throughout the day. It only takes about 20 minutes. Wow, this is an incredible discovery.